We're trying to eat well but it's hard when so many of our favorite foods don't fit our new way of eating. I've been taking family favorites from my childhood and giving them an upgrade. This is my take on my mom's cheeseburger pie and even with all the changes, it was a huge hit with Dan and the kids. First I made the pie crustless and cut the amount of bread crumbs in the filling in half. I'm hoping to keep working and eventually find a way to eliminate them completely, making it gluten-free. Then I cut the cheddar cheese way down and added some cottage cheese and egg white in its place. 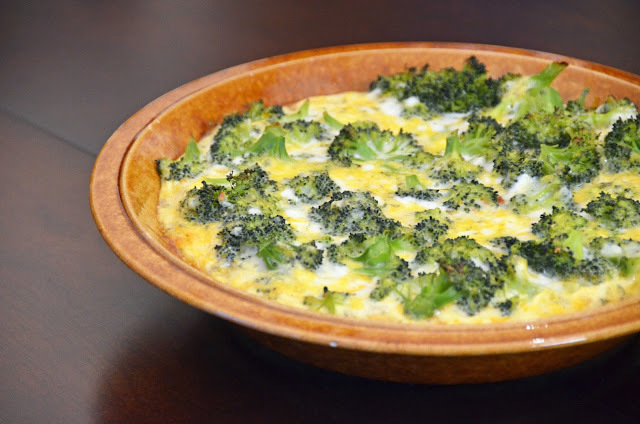 I lowered the salt content and added broccoli to the topping, making it more like a quiche. You sacrifice a little of the decadence but the flavor is still amazing and the top still has a pleasing cheesy texture. I hope you love it! Brown beef and onions and drain well. Mix beef and onions with remainder of filling ingredients. Mix topping ingredients. Spoon filling into pie plate. Cover pie with topping and bake at 350 until the topping is bubbly and cooked through.